Only Three More Shopping Days Until DNA Day! Save Big! Let’s face it: knowing the structure and workings of DNA is part of basic scientific literacy these days, which is why, after all, millions of us celebrate DNA Day. If you’re still doing last-minute DNA Day shopping, do we have a great deal for you! OnScreen DNA, the world’s best three-dimensional computer model of the double helix structure of DNA, complete with on-screen, tutorial-based simulations of how DNA works, is on sale at 50% off. And what better way could there be to celebrate fifty-six years since the 1953 publication of the Watson and Crick paper elucidating DNA’s double-helix structure than buying OnScreen DNA for only $19.53? It’s perfect for those students, teachers, and science lovers of all ages on your shopping list. And don’t forget to treat yourself. Don’t worry if you don’t see this until DNA Day itself—the online offer and the ability to get the software immediately by download will still be available right through April 25. Yes, we are celebrating with the “traditional” April 25 instead of moving to April 24, as many national national organizations, evidently wanting to avoid a weekend day, have done this year. Seriously, there is nothing that I know of that teaches DNA structure and functioning in such a complete and thoroughly three-dimensional way as OnScreen DNA, which I designed and programmed myself. The software runs on Macintosh OS X or Windows XP/Vista. The on-screen tutorials explain everything you’re seeing, and practically no prior knowledge is assumed. 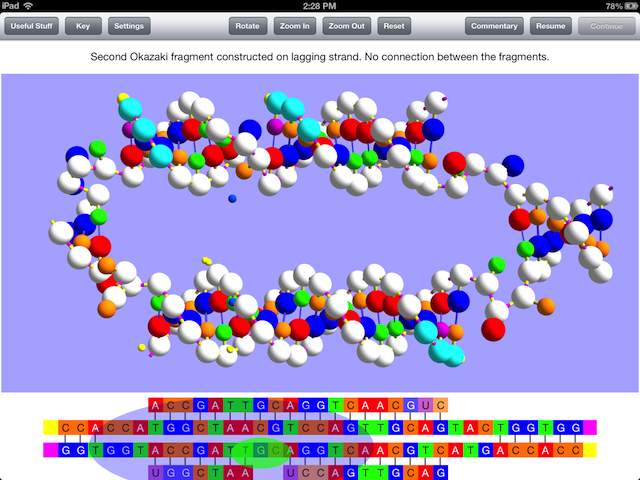 The animations of DNA and RNA chain-construction in OnScreen DNA are a lot of fun. I still enjoy them after having gone through them countless times during programming, debugging, testing, and just playing. You really need to see the three-dimensional structure of DNA, not just the two-dimensional ladders which animations encountered on the internet seem to invariably fall back on. Having programmed the OnScreen DNA animations, I can see why they do that—it’s a pain to do the three-dimensional programming. But it is worth it. Take a look at the results and judge for yourself. Just go to <onscreen-dna.com/buy_dna_online.php> to take advantage of this special offer.